LYNN – A devoted love for his native Hungary is a molding force in the life of A. Bela Sziklas, born in Budapest in 1897 and living now on Wave Street. Sziklas, who can look back on a long career in this country as an architect and engineer, has somewhere among his personal papers a photograph of his mother sitting in the lap of Franz Liszt. Liszt, the famed 19th Century composer who gave the world the Hungarian Rhapsody, may have provided Bela with an early inspiration in his love of his native land. His parents, Adolph and Justus Sziklas, who operated Hungary’s first school for girls, did much to continue that feeling. On the other hand, his wife of more than 50 years, the former Amy Hall, has longtime Horth Shore roots. Her mother, Mrs. Abbie Jane Hall, returned to Danvers with her family in time to celebrate the 100th anniversary of Danvers High as its oldest living graduate. Together, Bela and Amy are one of the area’s more interesting couples and they regale guests with anecdotes from their widely varying traditions. It isn’t every North Shore couple, for example, who can recall dinner dates with Bela Lugosi. 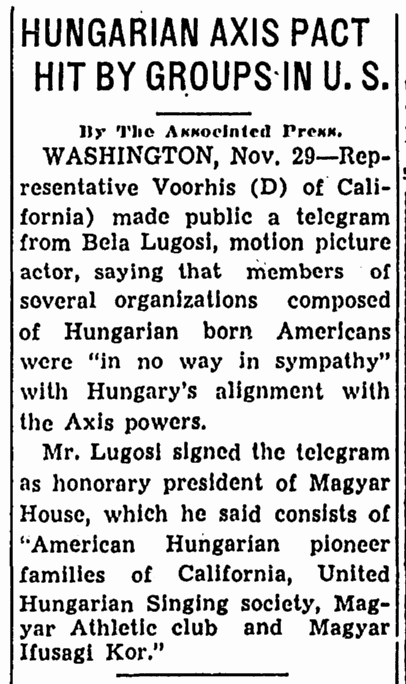 Lugosi, a native of Hungary, toured the country with a stage company during the 1940s, when his movie career was slowing down. Lonesome for contact with his fellow Hungarians, he was in the habit of looking through a telephone book for Hungarian names when he was in a strange city, and he would call strangers and ask them to lunch. As it turned out, the graceful actor whose penetrating bass tomes thrilled millions when he created the stage and film role of Dracula found a great deal in common with Bela Sziklas when they dined together. The school operated by Bela’s parents had introduced him to Lily Darvas, the famous Hungarian actress, a mutual acquaintance. He had met her as a teen-age girl, a student at the school and later at dancing class. Other mutual acquaintances included another renowned actor, Paul Lukas, and the playwright Ferencz Molnar. Lugosi made strong impression the family, Bela and Amy recall, especially when he kissed the hand of Bela’s sister-in-law, a courtly gesture he had mastered, evidently in the old country. Neither Amy nor Bela are overly impressed with any of the celebrities they have known, however; they both cultivate a cosmopolitan attitude in which they view others as people with rating their star quality. Bela Lugosi, famed Dracula of stage and screen, purveyor of more shudders, creeps and chills than any man on stage or screen, gave me his idea of horror. 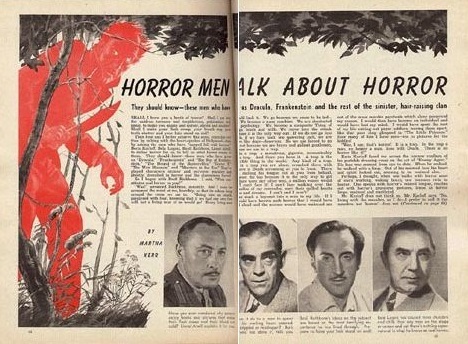 A more practical, everyday, utilitarian brand of horror than that expressed by Mr. Rathbone or Mr. Karloff. Most star-studded bill in years was the line-up of talent for the King Features Kingstown Karnival at the American Newspaper Publishers Convention, with Lucy Monroe heading a cast which included amongmany others, Victor Moore, Olsen & Johnson, Johnny Green, Kay Kyser, Arthur Treacher, Erin O’Brien-Moore, Frank Luther and Bela Lugosi. Transcribers Note: The article below is a very odd piece on the suicide of a young woman with slight and questionable ties to Lugosi. Why the author singles out Lugosi for bitter jabs is unknown. I have never seen this article in print. Around 1970, there was a copy in the clippings files at the Lincoln Center Library in New York (and like almost everything in those files, it is now missing). Yolande Evans was born Iris Fontana, in New York in 1913, to a family of newly arrived Italian immigrants. Iris often used alternate names. As Yolanda Bartolotti, she married and soon divorced in 1930, and made the news as a stowaway on the Ile de France ocean liner. Iris then travelled aboard, principally to China. She returned to New York claiming to be an agent and writer in theatre and movies, but I have been unable to find any mention of her in show business news. Yolanda married Harry Evans in 1939, and took her own life in April 14, 1940, apparently the night that Harry moved out of their apartment. Whether her correspondence with famous actors, including Lugosi, is genuine or forged has not been determined. 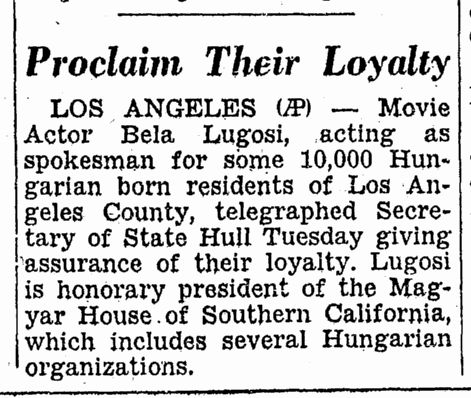 Just two months ago, Bela Lugosi, screen boogey man, who achieved immortality as Dracula, offered Yolande Evans, play broker, world traveler, leading figure in many adventures, $10,000 in cash for a story that would fit the shocking character by which the public believed him possessed. Just such a story was developing in Yolande Evans’ mind, but she did not sell it to the eerie actor. He was disappointed when he did not hear from her—until he read that she had killed herself. Where, now could he get that story? Well, he has the story and without paying $10,000 or $1 or even a dime. What is here set down represents a rough sketch, a first draft of Yolande Evans’ story. Any journeyman scenarist can fill in detail and dialogue. The scene of the story swings between Hong Kong and Hollywood, with a long interval on Broadway, a brief interval in a French jail, and episodes in many American cities. She seemed pursued by a horrible hallucination of fear that at times appeared to assume almost human form and within her heart burned an insatiable longing for love. So, she came to know many men, to encounter exotic adventure in many forms and finally to seek in suicide sanctuary from the pursuing fear! They found her dead, alone in her smart New York apartment with gas pouring from three burners in the kitchenette stove and on the telephone table a pad with the beginning of a penciled memorandum. “Call up ____.” Neighbors said that her broker husband, Harry Evans, had left the apartment the night before carrying several suitcases. Pictures affectionately inscribed and letters from celebrated screen and stage stars were found, too. Edmund Lowe, Dorothy Mackaill, Lenore Ulric, Gladys Cooper, Ruth Chatterton, Edward Everett Horton, and others were represented. 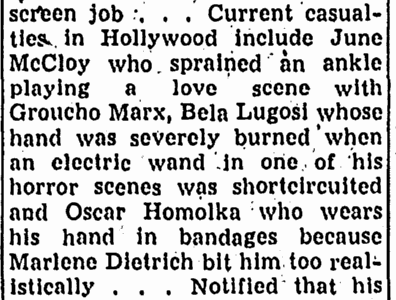 Apparently, almost all wanted plays and stories but Lugosi was most insistent. He offered $10,000 cash! Death came to her as the German troops were slashing across Scandinavia into which Hitler’s squadrons had been admitted by traitors. Of course, this must have been pure co-incidence—but Yolande had made mysterious trips to Europe and the Far East, with passports issued under strange names and the coincidence may be worth noting, Mr. Lugosi. As detectives dug deeper they found a fantastic figure developing, a dark, beautiful girl, ever on the wing as if pursued, often changing her identity. French, she was assumed to be, and she left the assumption pass, but the fact seemed to be that she was the daughter of Tuscan parents who came to live on New York’s East where the child, Yolande, was born. Yolande, Iris, Uelanda and other names she used in New York but even before that—at seventeen—she was the heroine of an elopement, imprisonment and estrangement! Ten years ago, she met a young transportation man who infatuated her at first sight. They were married two days later. Fear seemed to seize her then and within three weeks, she pleaded with the bridegroom to leave town with her at once. He refused. Penniless, she left him disappearing utterly, while the bridegroom searched the city. Two days after the girl vanished, she reappeared—on the high seas, climbing from the hold of the Ile de France on which she cleverly stowed away. Doesn’t Yolande Evans’ story begin pretty well, Mr. Lugosi? The dark child of the tenements, with the angelic face and fear-haunted eyes…the first thrill of love…the elopement and marriage…and flight again…with the big steamship …and the fear and terror gradually taking form…can’t you see yourself the personification of that bat-like figure, Mr. Lugosi? By all the rules of fiction, the little starving stowaway should have captivated captain and crew and dominated the luxury liner, but Yolande didn’t. She was assigned quarters with the steward and put to work for her board. By all the regulations of romance she should have met a French nobleman, a Hollywood producer, a Broadway millionaire—perhaps she did, but none of these did anything about it, so far as the record shows, at that time. But the idea, though trite, is still good, Mr. Lugosi. When the liner docked at Havre, the stowaway was tossed into jail for five days. Home she came and thereafter was lost to fame for several years. There came after five years, the expedition to Hong Kong and by that time, the transportation man and Yolande had parted and perhaps forgotten one another. As Iris Fontana, in 1935, at twenty two years of age, Yolande went to the Orient to study war conditions for publication and radio broadcasting. She returned last October and opened a Broadway office with a branch in Hollywood and gradually she became a figure of importance in the sphere of stage and screen—China—California—and Broadway in the middle—with fear taking more definite form gradually and Yolande feeling the increased need of protection. She hid behind other names than Yolande Palmer, Iris Patten, Iris Johnston. Yet officially she was Yolande Evans on Broadway and in Hollywood, after she met Harry Evans. She made money, too, and her Hollywood activities prospered. Then, just when things appeared at the peak, the vague fear became very definite and after Evans removed his luggage, Yolande could not stand life alone. 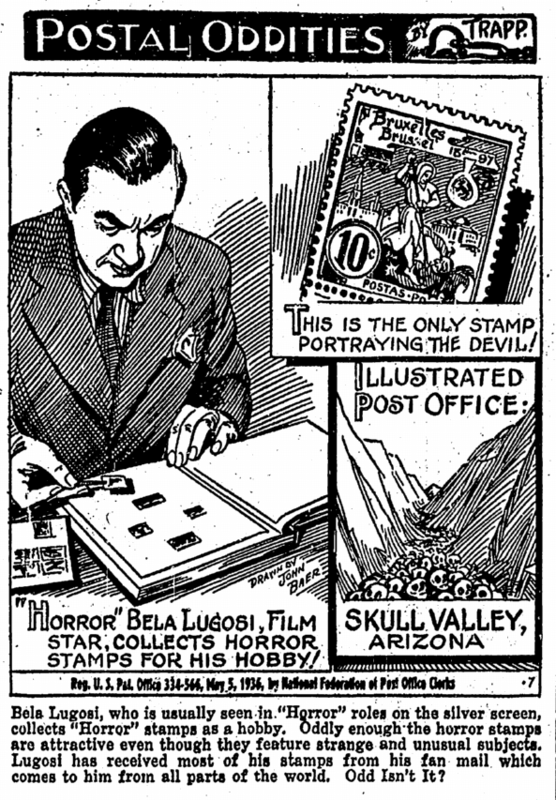 Even the Lugosi offer of $10,000 and 10% meant nothing. Why? The question remains open, wide. Why that strange, swift trip to the Orient and the prompt Hollywood connection that followed her return? Why the endless changing of her name? Why the fear—and the suicide? There’s your story, Mr. Lugosi, and what do you think of it?